On the previous article, I presented a new air purifier with an A.I. Engine called BRISE C200. In general, the best way to prove the efficiency of an air purifier is by taking measurements with a respectable 3rd party AQ monitor while there is an air quality issue ongoing inside the room and that is what I did. I used the uRAd A3 Monitor for the measurements and the device was placed near the purifier. At first, I had set the purifier off on purpose because I didn’t want the A.I. engine to kick in automatically before I was able to register the event. When a PM2.5 spike was registered, as you can see on the picture below from 4μg/m3 to 26μg/m3, I turned on the purifier and the air quality inside the room immediately improved till it returned to the normal PM2.5 concentration and the purifier turned itself off automatically. In the picture below you can see the FC200 4-in-1 Combo filter after one month of usage. The carbon pre-filter has captured PM10 particles, hair, dust and even a little dead spider, which was caught by the purifier’s air flow when it was set on Turbo Mode. 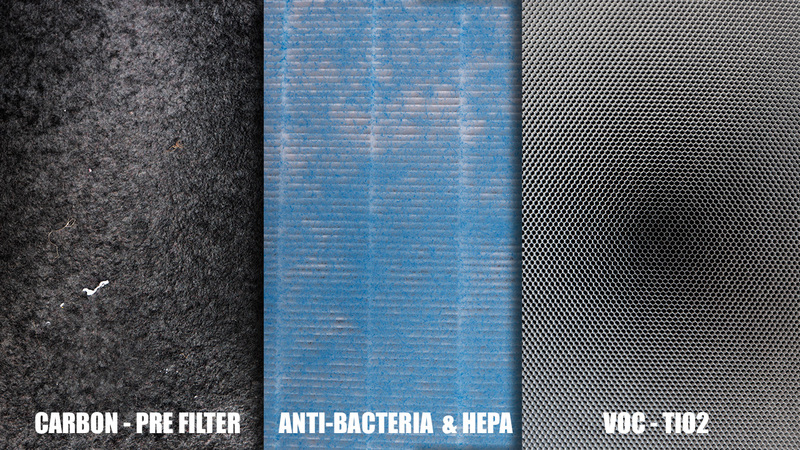 After that, we can see the blue anti-bacteria filter and under it the HEPA filter responsable for capturing all PM2.5 particles. Finally, the TiO2 will absorb harmful chemical vapors. I wanted to repeat the experiment with the BRISE C200 purifier and a different AQ Monitor in a different room and day, so with the help of the AirVisual AQM I set them up in my bedroom. This time it took 14 min into Turbo Mode to clean the air, the bedroom is a bit bigger. When the purifier achieved a concentration of ±1μg/m3, I turned it off and with the door closed the air inside the room was kept clean, but immediately after I opened the door the air quality was decreased. Below you can see the results. still pretty expensive, otherwise i would have bought one myself. Expensive or not? We had better look into the average cost for a long term, not only machine itself while purchase, but also the cost of filter, the life time of filter, the energy it consumes, smart device or not…..etc.